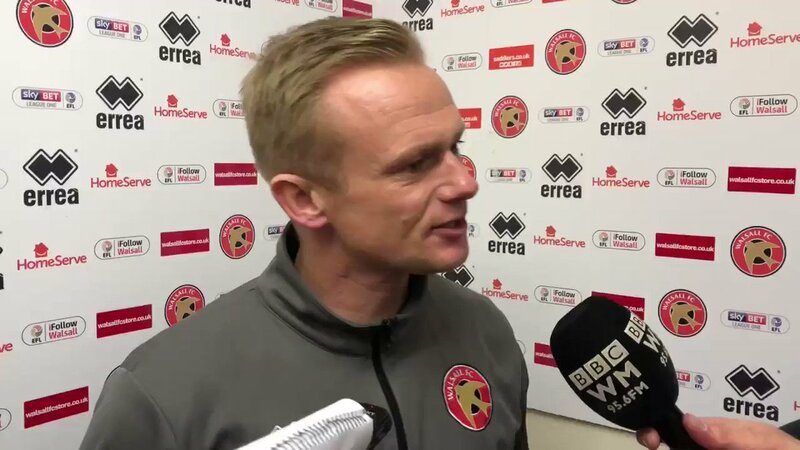 Walsall manager Dean Keates has spoken to the press following Saturday's disappointing League One defeat to Blackpool, and admitted that the result means that Tuesday's clash with AFC Wimbledon is 'massive' if the team is to avoid being pulled further into the battle to avoid relegation. The defeat to the Seasiders means the Saddlers are now just two points above the drop-zone and, with fifteen games remaining and after suffering four defeats in the last five league outings, have to get some points on the board if they are to continue to be the masters of their own destiny. Keates, who opted to make a few changes to his line-up as the Saddlers made the trip to Bloomfield Road, admitted that the teams' recent performances haven't been good enough, before calling upon his team to do all they can to ensure the club can continue to ply it's trade in League One for at least another season. Speaking to the assembled media, Dean said; "We’ve got a massive game for this football club now on Tuesday night. First quarter of the season, outstanding. Second quarter, nowhere near good enough. "We are going into a 15-game season and we need to make sure we are giving this football club every chance of being in League One next season. I’m a local lad, I'm accountable for it. And it hurts. It’s a tough one to take. "Jarvis has took the penalty and the keeper has gone early and made a good save. It hits him and spins out the other side of the goal, I think that’s where our luck is at the moment. On the other side of that, we have been denied blatant penalties. "Curtis Tilt first handballs it, then in the second phase Remi has almost been assaulted he's pulled his to the ground that much. There is also another blatant handball. "The referee is in good positions, I’ve seen them back. I spoke to him after the game and said, we will see what you are about. If he watches the game back, I will expect an email of apology for getting those decisions wrong." Keates then went on to talk about the Saddlers' worrying penchant for a slow start, admitting that he was disappointed to concede so early with Chris Long giving Blackpool a 14th minute lead before Harry Pritchard wrapped up the scoring with just two minutes of normal time remaining. Dean continued; "We’ve not given ourselves a chance the first 20 minutes. The way football is, you’ve got to earn the right to play. And we’ve given a sloppy goal away. It’s a great finish off the kid, tight angle, he put it in the bottom corner. But we need to be higher. "We were too deep. After the first 20 minutes, I thought we grew into the game. We had opportunities in the first half. And then in the second half, we were camped in their half and got caught out at the end."